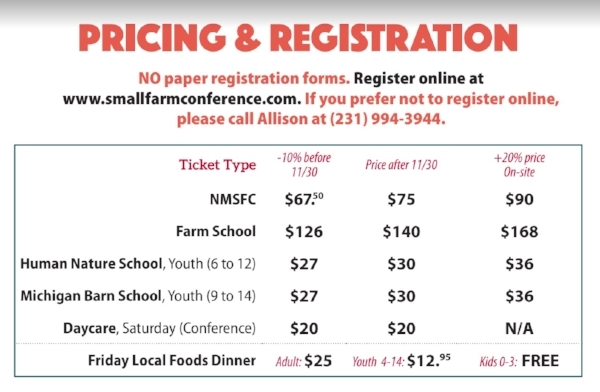 Announcing the 20th annual Northern Michigan Small Farm Conference—the premier educational gathering of regional growers, hobbyists and educators. In addition to Saturday's main conference with over 35 sessions to choose from, we have the two-day Trade Show and Friday's Farm School. This year all attendees can join us for Friday night festivities including a cocktail hour with cash bar, live music by 1000 Watt Prophets and NEW optional dinner ticket. Over the two full days, growers will have the opportunity to not just learn, but also connect and engage with their peers. For more info visit The Northern Michigan Small Farm Conference web page.